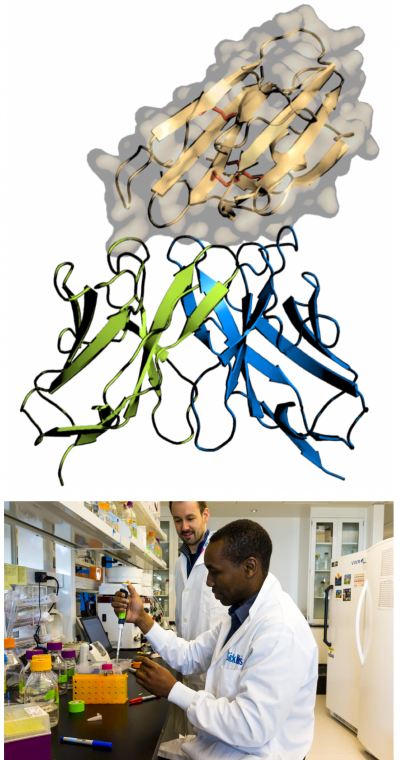 Top: Crystal structure of the malaria protein (Pfs48/45, orange) being recognized by the humanized blocking antibody (TB31F, green and blue). Bottom: Jean Philippe Julien (left) and his collaborator, Laboratory Research Project Coordinator Anthony Semesi (right), performing lab work at SickKids. Jean-Philippe Julien, Canada Research Chair in Structural Immunology, Assistant Professor in the Departments of Biochemistry and Immunology at the University of Toronto, and Scientist in the Molecular Medicine program at SickKids, and his colleagues focused on a molecule known to be essential for the malaria parasite Plasmodium falciparum to go through the sexual stages of its lifecycle. Disrupting that stage of the lifecycle has the potential to reduce infections and deaths from malaria because parasite transmission between humans would be blocked by inhibiting parasite development in the Anopheles mosquito. The protein in question, Pfs48/45, was identified several years ago as an important target for malaria parasite biology but its three-dimensional structure had remained elusive. People with malaria can naturally produce antibodies that bind this protein and can interrupt the lifecycle of the parasite. If a mosquito bites someone with malaria who made these types of antibodies, the transmission rate of the disease is subsequently greatly reduced. The key to designing transmission-blocking vaccines is to elicit enough of these types of antibodies in the general population. Having an understanding at the molecular level of how these blocking antibodies bind the protein provides clues for vaccine design. The research done by Julien and his team showed what the protein looks like, and how such an antibody binds it to block its function. This information can now be used for vaccine development. In addition, the antibody itself can be used as an intervention when administered to people in malaria-endemic areas, an approach that is called passive immunization. Indeed, a humanized version of this antibody is now in preparation for clinical trials in a malaria-endemic region, which will start to assess how effective this biomedical intervention can be at reducing malaria transmission.